Many times I simply want to shoot but the weather doesn't offer good images. Usually I use those conditions for close-ups, but other times I'm looking to capture a specific events. 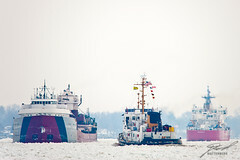 This happen a couple weeks ago when I wanted to get some shots of the icebreakers working to keep the frieghters moving through the St. Clair River between Marine City and Algonac. The weather was pretty cold, lightly snowing, and with just awful skies. I shot anyway since this was likely one of the few opportunities I'd have to get shots of action like this. Thanks to the RAW images from the D700 I was able to expand the dynamic range and bump up the colors, but they still don't look good. I posted a few of the photos to my Flickr Photostream as I felt the subject was compelling enough to share. 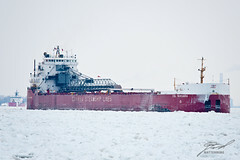 Last week I had an interesting comment posted to one of those photos by Flickr user Ilkka Porttikivi who like the image and felt that it was a great portrayal of shipping in the winter. The bottom line is when shooting digital images I feel it's generally worth at least trying to capture these images since whatever is happening at that moment will never be happening in quite the same way again. It's really about making lemonade from those lemons.